Approximately 8 months ago I had a Facelift, Neck Lift and Brow Lift with Dr. Jean. To say I am very pleased with my results is an understatement. I am 60 years old and my main concern was addressing my sagging face and neck before my daughter’s wedding. From my initial consultation to each follow up appointment, I couldn’t have had a better experience. 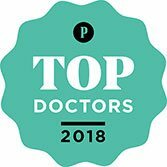 Dr. Jean’s bedside manner, thoroughness and unparalleled skill throughout the entire process confirmed that I chose the best surgeon to perform my procedure. My scars faded nicely and are at this point barely visible. I look 10 years younger and my confidence is restored!